The village of Rudrakshapalem awakens, and tells her tale. Five friends return to the village of their childhood to find that nothing seems to have changed, and at the same time everything has. Whose voice is it that called them back, and whose hand is it that now hunts them down, one by one? Palem’s grand old man, a Brahmin landlord, their childhood storyteller, makes one last ditch attempt to save his village from ruin at her hands. Will he succeed or will his past catch up with him and demand fair price? Two boys, one blind and the other lame, skirt the village borders at the old Shivalayam, listening, staring. On their faces they wear smiles of contentment. They sleep well. They see happy dreams. A TV reporter arrives to study the village, only to sink deeper into the mystery with each passing day. And hovering above all of these is the shadow of Lachi, who is believed to haunt the old Shivalayam on full moon nights. Some say she’s consumed by lust, others call it madness, but all catch the red glint in her eye and the icy calm in her voice as she croons a sad, lonely song. The one thing she hungers for, that will satisfy her soul, is the fire that will burn Palem down to ashes. The village of Rudrakshapalem awakens, and tells her tale. Listen closely. It will chill you to the bone. The book starts off in 1984, in the village of Rudrakshapalem, with the story teller Avadhani, telling a story to the children of the village. As the kids scream out that they are bored of the regular 'Rama and Sita' story, Avadhani decides to tell them the forbidden story. That of Vijayalakshmi or Lachi, the woman who murdered her husband and disappeared. What he doesn't tell the children is his fascination for her. So yes, the story teller holds on to his part of the story. Yet Lachi appears at regular intervals to the people of Palem, near the Shivalayam that is said to be the reason for her madness. Shivalayam is a tainted place that robs people of their sanity leaving them crazy and empty. A young Venkataramana and his friends then decide to check if they could see Lachi. Armed with some Tamarind gum to keep the mosquitoes at bay, they arrive at Shivalayam and wait for the glowing Lachi to appear. But they come back disappointed. One fine day in 2001, the adult Venkataramana who has lived for seventeen years in the city including three years in Australia decides to come back and visit the village he was born in. He is not very happy to be returning, but why he returns is something that only he knows. His friends are back at the village too. But why? What significance does Palem hold to them that they came back from their comfortable lives? Also now the village of Palem is cursed and there are people being found dead every now and then. The stories of these murders are covered by the reporter Sonali Rao who tells her stories via articles in the book. What exactly is going on in Palem now? Is it the industrialisation that is taking it down, or is it the presence of Lachi? Every person in the village has a different story to tell and a mystery beneath it. The story soon shifts from Sonali Rao's articles to her diary, shaking the ground of the very premise. What is the mystery of Palem? And what about the two cripple boys? What is the story they hold? Is the village really haunted or there is a reality hidden within it? The climax left me stumped. It had been a while since I read a book by an Indian author with such a crisp narration. The language used is simple and the dialogues are more than efficient. I liked the fact that the author has used local names that resonate in every village. At times I felt that the number of characters were too much to remember, but they are not out of place. Each one of them is needed and carefully written, be it Sarayu or Arvind or any body else. The author paints a scene in your mind with his narration of the village. You can close your eyes and imagine it. Be it the dirty teeth of Avadhani or Sarayu's anklets. Sonali Rao is the heart of this book, while Lachi forms the soul of it. Such beautiful characters that you would not want to stop reading about them. I like the references the author has made to his previous books too. Smart and detailed descriptions, with a gem of a story. Chilling yes, but memorable. It would take me quite a while to get this story out of my mind and exactly for this reason I would want to read this book again. And again. I never want this story to leave me. Verdict: A brilliant read. Sharath is the master of this genre. Yes, for the first time ever I have rated a book more than four stars on my blog. And that now calls for a celebration. So, I'm having a giveaway on my blog. That also is a first for LOL. One lucky commentator would win a copy of this amazing book. Just tell me about how you used to spend your holidays as a child and the stories your grandparents used to tell you about. Did you grow up in a city? What was it like to visit your grandparents in the village? Tell me your story in the comments section below and stand a chance to win a copy of this book. The giveaway ends on the 9th of December and the results will be announced on the 10th. Just to pique your interests about this book a little more, you can read the first three chapters of this book here. Check out the site of the author here. Sharath runs many such writing contests on his own blog. Click here to take a look at some of them. All the best guys and I'm looking forward to read your wonderful stories. May the best memories win. My sister and I grew up in a town which was a couple of hours away from my grandparents village. We used to drive to visit them at least once a month. In the town , the neighbors smiled once in a while, the kids never came out to play and we were also mostly engrossed in our Enid Blytons and Judy Blumes. Picking up berries , playing in the haystack.. crossing a stream on a small wooden plank and listening to tonnes of stories .. . Summer was more special coz we had the best of all mangoes all the way. She told us stories about her childhood , about her meeting my grandfather, about the pranks of my mom and her sisters... those were the ones I loved to hear. Later , when mom scolded me , I would take it as a weapon against her. She passed away when I was in school, I found myself admiring her all the more in the later years. Never seen a woman who was so strong , so determined and so loving and always there when we needed her. I grew up in a city and didn't have anyone in the village to visit for the vacation. However, our family had a tradition revolving around one village. Every April, for the temple festival we used to go to the village called "Narthamalai" and for that one day before the festival we would live the life of the villagers along with them. Although nowadays mobiles have reached villages, when I grew up, the village was very backward, even without fans and light. It gave a very different perspective of life. Some of the families gathered together and cooked for the entire village in huge pots and we all ate together. All for that one full day. Then we would take part in the temple's traditions for the festival and got back to the city. Although initially, I used to dread how I am going to spend a day in such a difficult setup, it taught me some aspects of life which could not be reached by conventional methods. And till date we are doing the same. Although the village has become more modern by having acquired electricity, communication etc, the one day of spending some time away from our gadgets and corporate habits, along with the people who are still simple minded and trustful gives me a sense of elation a lot more than a day in the busy city gives me. I spent a part of my holidays at my grandparents place and many days exploring various parts of India. I loved my vacations a lot! Not to forget the story-sessions of my granny. Brilliant review. And the book indeed deserves a read; I'm going to order it soon. Unfortunately, I didn't have the good fortune of spending time with grandparents as a kid. My father's parents died when he was a little boy, and I never got to know my mother's parents that well at all, for various reasons, since we lived in the north for a large part of my growing up years - and I went away to boarding school when I entered high school. If you are giving a book 4.5, it must be really really good!!! My vacations were usually spent at home with my grnadmother who was always ready with ghost/yakshi stories which she was always a part of. They were breathtaking and mysterious, and I wonder if they were actually true because if they werent, then she should have been a writer. Her stories were that good!! about my childhood,actually my grandma used to tell me stories about common men's sufferings and lord's mercy.I have never had the fortune to live in a village coz my grandparents were actually living in a city. ps-i have never won a contest and doesnt expect to win this also! My childhood memories includes spending every summer holiday in haridwar wid my family at my nani's place. Remember getting up early ard 4 to take stroll at neeldhara n visiting chandi devi up the mountain which we used to go trekking. Also for every day bath we used to go to ganga river, it was hardly a km from my nani's place. Then every night bedtime story by her. Nonetheless thr used to be a weekend getaway from haridwar like visiting mussoorie, dehradun etc every summer, my mama ji used to drive us in his ceat car. Still remember crossing through jungle areas, spotting deers was a usual on our trip out of haridwar. It used to be fun. Woh bhi kya din the! Childhood memories are the precious memories we will ever have. Our parents and grandparents play a pivotal role in the creation of those memories.This is a tribute to them from my side to celebrate those cherished ones. Every vacation meant spending time with my grandparents during the childhood.Though I am born and brought up in a city, my parents made sure to make me and my sister learn about what life actually is. Spending time in a farm or visiting village or being in the kitchen of my with firewood as the source of cooking and special activities like sewing or fishing became my favourite pass time.the yummy food prepared by my grandma was the tastiest..I especially enjoyed hearing about the “good old days” and what my parents were like when they were little.the stories about their childhood upbringing,schooling,india’s independence time was a treat. By telling fun family stories and singing silly songs,they actively passed down their family heritage to me and my sis. They are the true pillars,mentors n memory makers.Their love is unconditional. They had a wealth of gifts, talents and wisdom to share. One blink of eye n past has gone. To rediscover the tears, fears n joys. Hey guys! Thank you very much for your responses. And Soumya, thanks for your review. Soumya will now pick the winner - you have her word that it will be completely random - and announce it as a comment here. I will then arrange for a copy to reach you. Thank you all for the wonderful response. I really loved all your entries and I so wish I could choose more than one winner for this. Thank you Sharath for being a wonderful writer and giving me an opportunity for hosting a giveaway at my space. I am glad I got lucky on the first giveaway on your blog Leo! Thanks much, I will read this and do a review on my blog :) I have mailed you the postal details. Excellent. Congrats, Keirthana! 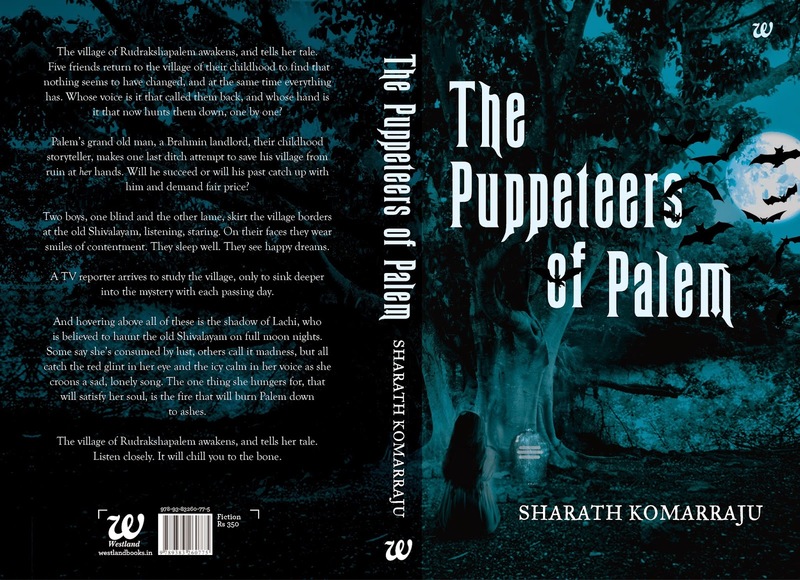 Soumya, if you email Keirthana's details as soon as you receive them, I will make arrangements for a copy of the book to reach her. Thanks again, everyone!